The initial drawings for the paintings became crossing zigzag or wavy lines. 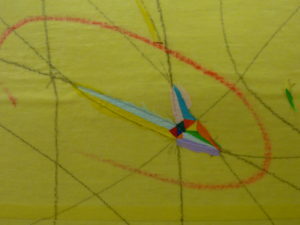 Their crossing, like in the last paintings of cities, is intersected by other crossing lines bisecting the original angles. From the places where they meet, are between them drawn connecting lines. While colouring the surface, using a few blue, red, and yellow colours, I would first leave some adjacent areas white. In other paintings I focused on colouring of clusters of smaller areas. Sometimes I left on the canvas the pencil drawing, sometimes instead of the white background colour I used the gold, to which I would choose colours under the influence of the chromaticity of Gothic paintings. 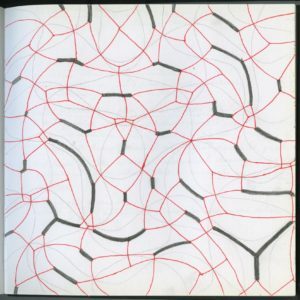 In the later paintings I drew more complicated and denser structures, mainly wavy, with bisecting angles in the intersecting lines. Then I coloured the almost tiny groups of surfaces. 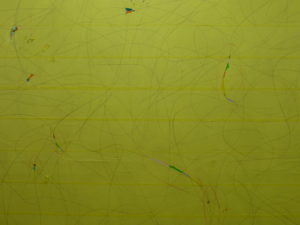 I was wondering whether, even in the case of an invisible pencil drawing, in the large empty surfaces and the very small colour surfaces the viewer would sense that the shapes and sizes of the clusters are given by a hidden order, or whether these paintings would give an outweighing feeling of randomly scattered Lego pieces. In recent years, my paintings are based on some simple ornamental structure, which I discover for myself and examine. Sometimes I am attracted by some of their side effects, which I then develop and I watch in wonder an almost organically developing new structure, which becomes a partly visible, sometimes hidden network of my works. These structures can be seen both in surface and in space. Sometimes they manifest themselves only in detail. As if in one painting I used a rhythm where emptiness alternates cluster, both seen from different distances. Often the only visible part is the one that appears random and is subjected only to an aesthetic decision. What entices me is the notion of some idea, some order.